Back in 2005, Lego released a set (number 5526) simply called "Skyline." It featured the Sears Tower, the Statue of Liberty, and a couple other non-descript buildings, all in micro-scale. I wanted it. Really, really wanted it. But never got it. So it goes. 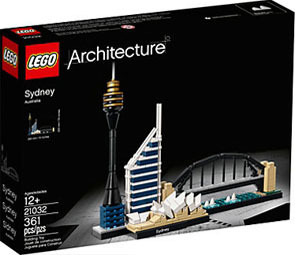 But in 2008, Lego started the Architecture line, a collector-oriented line featuring the world's most famous buildings - sometimes alone, and sometimes in city-themed sets. I'd been eyeing the Architecture sets for years, but never got to try them out - until last year, when Toys Я Us had a sale going on, and I picked up my first foray into the line. As Austalia's largest and most famous city, Sydney encompasses both striking modern architecture and many of the country's most important historical landmarks. Sure, it's no Statue of Liberty or Sears Tower, but if you're looking for distinctive buildings, you can't go wrong with Sydney! The Architecture sets are sold in stylish black boxes that are clearly designed to convey "this is not some silly toy, this is a fancy product for fancy adults," though there's no difference between the bricks in one of these sets and the bricks in one of those $4 polybags you can get near the registers at Target - Lego is Lego is Lego. The instruction booklet is similarly deluxe: rather than a stapled pamphlet, it's a square-bound book with information about the city and buildings in the front (in English, French and Spanish) and trivia facts scattered throughout the instructions in the back. The book's 135 pages long, and there are 113 steps to building the complete model (with some of those having multiple sub-steps themselves). The book has you tackle the buildings from right to left, but we're going to take a look at them in order of real-world completion. We begin with the Coathanger - also known as the Sydney Harbour Bridge, opened March 19, 1932 after six years of construction. It's the sixth-longest arch bridge in the world, and until 2012, was also the widest - it has eight lanes for traffic, one for pedestrians, one for bikes, and two for trains. 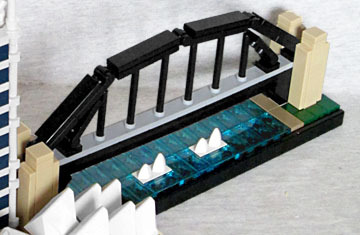 The Lego version is only one stud wide, and uses black hinged pieces to create the archway. The support wires are an excellent cheat: they actually stick up from the grey "road" tiles, rather than hanging from above. Shame the cente rtwo couldn't be longer, however. The beige pylons at the corners barely connect to the rest of the structure, which is fine: the real things are mainly decorative, because the arcitects were afraid people would think the bridge was unstable without them. The Lego bridge measures 6⅝" long and 2⅝" tall. 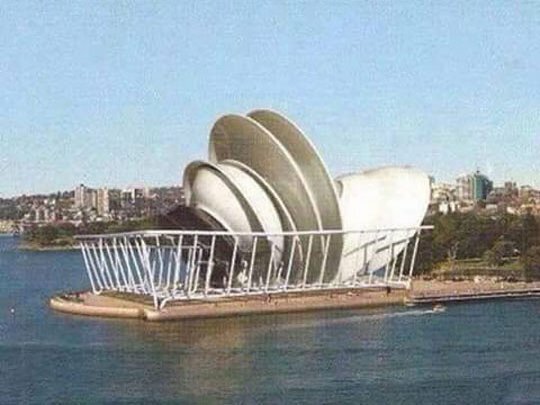 From the Coathanger to the Dish Rack, next we've got arguably the most famous building in the eastern hemisphere, the only building you think of when you think of Australia. [That daycare with the sign that uses the murder font? --ed.] NO! Syndey Opera House. Agitation for the venue began in 1940, but it took 14 years for the project to get underway. The design was selected in 1957; construction began in 1959, before the plans were even finalized; although the original plan had called for a 1963 completion date, it took another full decade to finally reach fruition. But, it was worth it, because in 2007, the Opera House became the youngest recognized UNESCO World Heritage site, and only one of two inducted while its architect was still alive. The Opera House sits on a broad podium, which in Lego form measures 12 studs long and four studs wide - 3¾" x 1¼", in other words. The shells or sails or whatever you want to call them are white, and built fron triangular blocks to get the appropriate "pointed" shape. They're mounted on hinges, so they can tip toward the sky appropriately. Sydney's tallest building opened in 1981; it's been known by plenty of official names - Sydney Tower Eye, AMP Tower, Centrepoint, Centrepoint Tower, Westfield Centrepoint Tower, Ol' Pointy, The Black and Gold Stick, the Gold and Black Stick, The Stick of Indeterminate Colors, Sky-Gouger, Original Famous Ray's, The Arc de Triomphe (changed after France sued them), The Shortest Building in the World, Shorty, Axe Body Spray Presents: Shorty, the Axe Body Spray Tower... lots of things - but everybody just calls it the Sydney Tower. It's like the way we in America have "The 'Dr.' Roody Jimson Home for Mentally Stable Geniuses," but we all just call it "The White House." 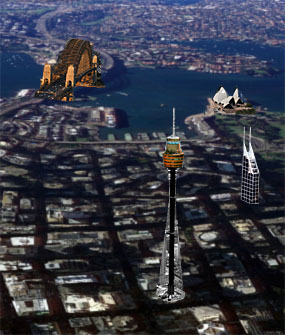 The real Sydney Tower is over 1,000 feet tall, which in Lego scale apparently translates to 7¾". The white spire on top is a simple rod here, but the golden turret is made from stacked discs to suggest the scalloped ridge that's up there, and the observation decks are made from alternating dishes of black and gold. The support wires that help hold the tower up are done as solid cones, here, because there's no real way to do "open and airy" at this size. Maybe clear pieces, with a black core running through them? Dunno. The tower isn't free-standing, instead built on top of an existing shopping mall - Westfield. Westfield Sydney is included in this build, mainly a big blue block with translucent "windows" on the front. It's not quite accurate to the real world, but nobody's looking at that part anyway. Finally, we have 2005's Deutsche Bank Place, aka the "no one would buy this Lego set if it only had three buildings in it" building. We'd say that Deutsche Bank Place is known for looking perpetually unfinished, but that would be a lie, because Deutsche Bank Place is not known for anything. Deutsche Bank Place is not known. It's distinctive, but not famous. The real building stands 39 stories tall, but was supposed to be bigger: the architects failed to consider how much sunlight it would block, so they had to cut it down and switch to the "stairstep" design so the Parliament - the freaking Parliament! - wasn't cast into eternal twilight. Way to ignore practical considerations, Norman Foster! That's why the two spires on the north end are so tall: they were meant for a bigger building. The white framework is done as rods held in place by clips, but the interior parts of the building are dark blue instead of black for some reason. The Lego building stands 5½" high, and has a ⅝" x 1¾" footprint. The Architecture sets don't just feature buildings sitting around by themselves - this is a more presentational line, so the set includes a display base for them to sit on. It's a flat black platform, built like you would any other Lego set. It's 10" wide, and has a nameplate on the front identifying it as Sydney. Each of the buildings has a specific slot where it's meant to go, with the Opera House set in front of the others. The really cool thing is that the Harbour Bridge gets translucent blue tiles underneath it - water! There are even two sailboats down there, and sand and grass on the right side representing... Milsons Point/Bradfield Park, I guess? The really amusing thing is, while a lot of liberties have been taken with the buildings, the general layout is accurate: coming down from the north, you'd cross the Harbour Bridge, the Opera House would be way off to your left, and then you'd pass Deutsche Bank Place before getting to Westfield centre and the Tower. It's exaggerated, but it's right - all the buildings are even facing the right direction! 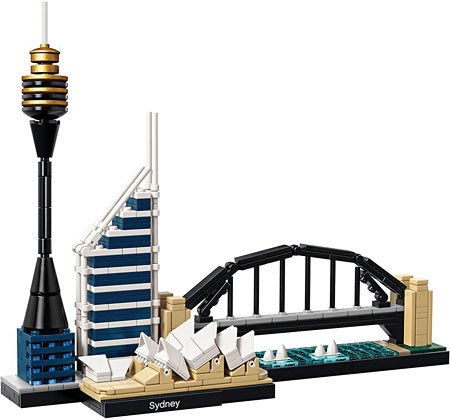 I'm still a bit sad that I couldn't get the 2005 Skyline set, but Lego Sydney shows that the Architecture line is pretty cool in its own right. I'm glad I finally got to give it a try.